The Personal Freedom Center integrates online and in person Life Coaching, Workshops, Seminars, Book and Information Products sales and Book Publishing by Invitation only. ​Our focus in on Relationships, Emotional Wellness, Spirituality, and Physical and Financial Freedom which are the "Five Core Pathways to Personal Freedom" defined by Author and Life Coach Freedom Gale! We stress that the most important relationship that needs to be intact before any other relationships can be successful, is the relationship with self. Gale says, that the importance of having a Spiritual Concept of Living is equally as important to Self-Knowing as God-Knowing, and understanding the union that fuzes man and Spirit as One. Therefore, all of her therapies are Spiritually based and Heart Centered aiming to assist a person in experiencing that Oneness. With Heart Centered Therapy, our first work is looking into our own hearts and lives, and accepting what is there, the good and the bad. Then bravely facing them with love, understanding, gentleness, and forgiveness. 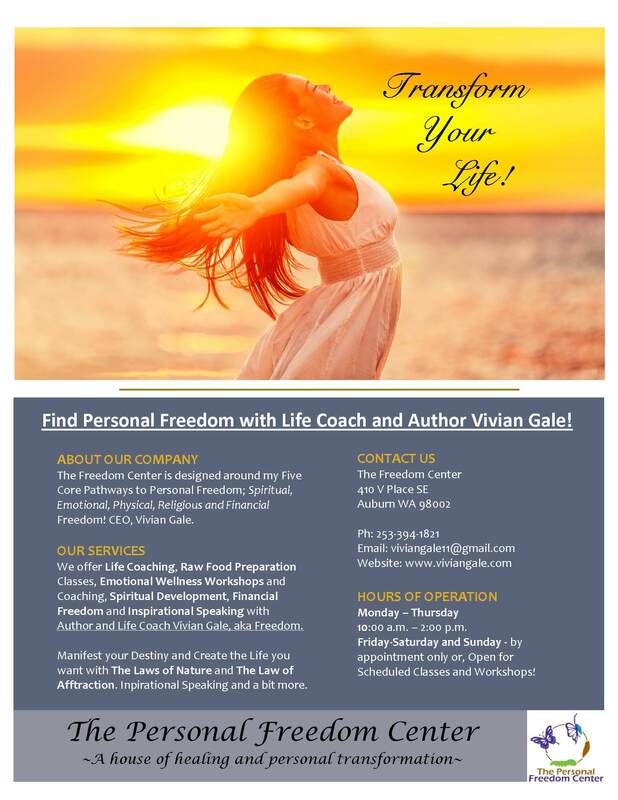 Your life will be transformed as you move through The Five Core Pathways to Personal Freedom here with Author and Life Coach, Freedom Gale. You don’t have to do it alone, but it’s the journey each man will and is destined to take in their lifetime.